In December, UC Berkeley announced a "groundbreaking" financial aid program called the Middle Class Access Plan (MCAP), which Chancellor Birgeneau hailed in the press release as a means of "sustain[ing] and expand[ing] access across the socio-economic spectrum" in an era of incessant tuition hikes. The following analysis was written by Zach Williams and posted at the blog Good-In-Theory. A summary of all the data used in the writing of this post is available here. What could be wrong with increasing access? Even further, what could be wrong with increased access for the middle class, when it appears as if current policy has been pushing the middle class out of Berkeley? But wait, who is the middle class? And how are we increasing access for them? And why are they being pushed out? And why does it matter -- that is, why is that the problem we’re throwing money at? Because there are plenty of problems at which to throw money ($10-12 million dollars worth of money, in fact). But Birgenau has chosen this one. So what is the problem, exactly? A shrinking middle class population (likely chiefly white) at the UCs. But why is that happening? Because the high tuition/high aid model has led to a split in the population of the UC, divided between low-income families (~36% earning under 50k/year at Berkeley) and high income families (~30% earning over 150k/year at Berkeley. Another 10% or so still fall under the Blue and Gold program, which caps out at 80k. The remaining band of 20-25% has been narrowing, and thus needs our help. Why? Well, because apparently declining enrollment among ‘the middle class’ is inequitable. Never mind that likely 80% of California children live in families earning under 80k/year, while over 40% of UC Berkeley students come from families earning over 100k/year. You see, under-representation of the bottom 80% is normal -- it’s expected, even, along with over-representation of the top 10%. But decreasing enrollments for part of the top 20% of children in the state? That can’t be tolerated. So we have to lure them back in. And don’t be fooled -- this is about nothing other than luring people back in. Sure, MCAP has a friendly face to the extent that it eases costs for already enrolled middle class students, but this program is not about a temporary spate of relief for enrolled ‘middle class’ students. MCAP is taking a long view of the strategic situation in which the UC finds itself. And that situation involves intense competition with the Ivy league and other top tier liberal arts colleges and research universities over elite students. So who are the students UC can draw in? Well, they aren’t Asian students, who attend the UC at a rate much higher than any other group already. There may be a few other minority students -- ~2200 UC system wide who are accepted but elect to go elsewhere and have middling acceptance rates. But the bulk of those who UCB is now pursuing fall into 10k or so white students who are admitted, but do not accept, UC enrollment. These students are, proportionately, the least likely to both apply to the UC and to accept enrollment when admitted. Where are they going? Comparable private colleges, of course. That’s why, nationally, the MCAP program is perceived as a first effort by elite public schools to compete with the Ivy league over the upper middle class -- and this gets precisely to the point. MCAP isn’t about Californians. It’s about Out of State (OOS) enrollments. While UC Blue and Gold is restricted to California residents, MCAP is restricted to ‘domestic’ residents -- that is to say, residents of the United States. And what do non-Californian ‘domestic’ residents pay? Another 23k/year in tuition. That more than covers any pittances extended to California’s middle class. What MCAP does is introduce further granularity into the price discrimination scheme run by the UC. UC Blue and Gold allowed for an attenuated rate of tuition for in-state students earning under 80k. But there’s no fidelity among out of state students, who don’t qualify for Blue and Gold, or other in-state inducements like Calgrants. So while a California family earning 80k/year may pay 0 tuition, receiving 12k in subsidy to the cost of attending the UC (priced at 32k total, 24k excepting the expected student contribution), an out of state family earning 80k has a 35k a year tuition bill, plus that 20k/year in cost of living expenses, with no relief in site. But the UC doesn’t need 35k to break even. Berkeley, the most spendthrift of campuses, lays out 19k per student. That’s 12k in tuition dollars plus 7k in state funding. OOS tuition has to make up the 7k not covered by the state. The rest is pure profit. Every lump of OOS tuition delivers about 16k in profit. By fixing cost of attendance at no more than 15% of income for the in-state portion of fees, the UC has committed to giving middle class families up to 12k in subsidies. For Californians, some of that would be covered by Cal Grants. For those who qualify for Blue and Gold, some of that would be covered by Pell Grants. But for out of state students, it all comes from Berkeley’s institutional aid. The MCAP program allows for previously unavailable granularity in pricing for OOS students. Now, instead of all OOS students being saddled with roughly 35k/year in tuition, they will pay anywhere from 23 to 35k/year in tuition (disregarding non need-based aid). This is to say that the chief function of MCAP is to further increase the ability of Berkeley to recruit relatively wealthy out of state students who are willing to pay a lot, or at the least take on a lot of debt, in order to attend the UC. OOS students, after all, accept admission to the UC at a lower rate than in-state students, so anything to pull in more of these cash cows is desirable. The other side of this story is how this program speaks to the general structure of the UC’s funding model. MCAP clarifies how tuition, through Blue and Gold and MCAP combined, functions effectively like a tax rate. This is a tax rate expressly for the purpose of redistributing income -- all the recent tuition increases have consisted of a return-to-aid portion, which is to say a significant portion of all tuition increases has been devoted to mitigating the effect of those tuition increases for people with low income. For families within California, this reflects how the failure of state policy has led to the UC replicating the functions of the state. Because the California public as a whole is not willing to pay taxes to support public education by popular mandate, the wealthy in California have been able to avoid subsidizing the accessibility of the UC. Instead, the UC has taken advantage of high demand for its product and the loose climate in higher education funding (through Federal support and student loans) to transfer the burden of maintaining UC accessibility on to wealthy or debtor students who wish to attend the UC. In this way, accessibility to a quality university system is now contingent upon the realized demand of the wealthy, and the indebted, for that university system. Quite simply, the UC’s public mission has been privatized. Private charity, in the form of OOS tuition and ever increasing in-state tuition for the relatively rich, maintains access for poor students. In this way, the burden of maintaining the UC is being shifted to wealthy and/or debtor students by raising their ‘taxes’ with nearly yearly tuition hikes. The turn to increasing enrollment of OOS students, coupled with the middle class access plan, allows the granularity of this tax to extend across the most profitable segment of the UC’s population. The failure of tax policy at the state level has led to taxation at the UC level. This shifts the tax burden in three ways. First, it shifts the burden from CA taxpayers to CA families with children, who are, on average, poorer than CA taxpayers (though the children who go to the UC are not). Second, it shifts the burden to out of state money. Third, it shifts the burden onto in-state and out-of-state student and family debt. What this leaves behind is any focus on the demographics and issues of California as a whole. 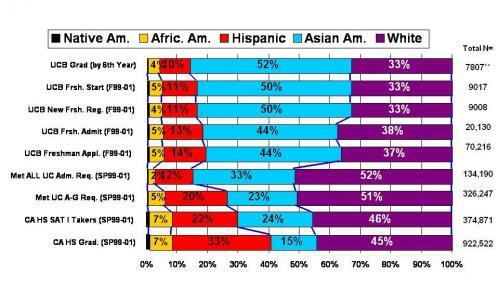 The UC remains disproportionately wealthy while Hispanic and Black students remain disproportionately absent. The collapse in public support and the turn to privatized financing cannot be disentangled from the persistent and endemic racial disparities proper to the UC. Increasing state diversity and increasing UC privatization are not simply coincidental. Rather, the demographic shift in the college-aspiring population of California has accompanied a general increase in private responsibility for the cost of college. The UC has been able to sustain this shift while still enrolling poor students by relying upon the contributions of out of state students and wealthy in-state students, as well as increasing the expectations of student and family contributions across the board for all students, regardless of income. As state funding falls, this means that the UC’s continuing operation as an accessible university comes to depend more and more upon the private demand for an elite education of non-Californian students. Poor Californians are increasingly at the mercy of the largess of rich out-of-staters. In this way the public mission of the university has come to depend upon the private wealth of the rich who choose to attend it, and as such the character of the UC, as a public university, depends upon its ability to cater to these students. This is to say that the UC must cater to the desires of the rich (largely white) kids who keep it afloat rather than the poor (largely hispanic) ones who make up a growing portion of the state. And so national competitiveness with elite institutions trumps focus on the challenges faced by California’s youth. MCAP, rather than acting as a boon to California’s middle class, merely serves as another way of catering to the rest of the country’s elite students, by further incentivizing their attendance. In this manner, the people and students of California are losing control over their University, as their University, and their ability to attend it, comes to depend more and more upon the choices of others.